A few weeks ago I attended a women's retreat in Seattle. This meant that I would spend at least twelve hours in the car - six hours driving each way - not including any incidental driving over the weekend. So I decided to try to listen to an audiobook from beginning to end for the first time in, well, ever. The Storyteller was that book. I generally don't care for audiobooks. Verbally told stories don't seem to stick in my head as well as reading printed words on a page does and it's not often that I find myself doing something that keeps my hands busy but leaves enough space in my brain for listening to and comprehending a complex story. But I didn't mind this one so much. I actually think The Storyteller worked well as an audiobook. The reader did a good job differentiating between characters and her German accent was pretty decent. It enhanced the story rather than being distracting, which was my initial fear. they see in each other the hidden scars that others can’t, and they become companions. Josef's deep, dark secret is that he was a Nazi - a guard at Auschwitz, to be precise - and he wants Sage to kill him as he believes he deserves. The story alternates between different perspectives: Sage, Josef, and Sage's grandmother, Minka, who was a prisoner at Auschwitz. So much has been written about World War II and the Holocaust, it can be difficult to find new ground to tread, but Picoult breathed life into these horrific, inhuman situations, finding the slivers of joy, humor, and humanity that remained amidst the tragedy and horror. 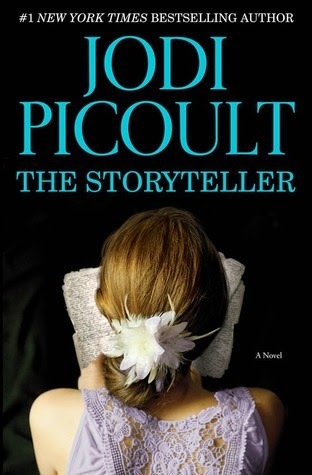 Picoult creates interesting characters with rich backstories and believable foibles and traits. I'm not sure I can say that I "liked" Sage - I object strenuously to infidelity, particularly when there's a marriage involved - but I could sympathize with her pain at the loss of her mother, her unhealthy coping techniques, and her loneliness. It was interesting to see how she changed over the course of the book - the strength she drew from the process of learning about Josef's past, turning him in to the authorities (personified by Leo Stein, a lawyer with the Department of Justice, who also develops a romantic relationship with Sage by the end), and settling on her final decision. Even the supporting cast of characters is intriguing. One of my favorites is her boss at the bakery and best friend, Mary D'Angelis, a former nun who found her true calling baking and painting. Minka's relatives from decades ago are three-dimensional and relatable, living as family and friends and reacting to the unbelievable events of the Holocaust. But with all that, I can't help but feel just a bit emotionally manipulated whenever I read a Jodi Picoult novel. She sets the plot up to move in a fairly predictable direction and then there's always some kind of "gotcha!" twist toward the end designed to throw everything on its head (which actually gets pretty predictable itself after you've read a few of her books - I saw the twist in The Storyteller coming by halfway through). It's not that I have anything against twist endings, or authors who want to surprise readers into thinking differently about a charged topic, or dealing with heavy, emotional issues, but it seems a bit exploitative to use the suffering and death of millions of people as a tool to get your point across, you know? So read for the fascinating and well-drawn characters, read for the insight into the incredible depths of inhumanity humans are capable of, read if you're drawn to learn more about the Holocaust. Just brace yourself for the emotional whiplash.